Last night, as the clock struck twelve, I was busily proof-reading when a chap asked me what exactly a Grand Panjandrum is. So she went into the garden to cut a cabbage-leaf to make an apple-pie; and at the same time a great she-bear, coming up the street, pops its head into the shop. "What! No soap?" So he died, and she very imprudently married the barber; and there were present the Picninnies, and the Joblillies, and the Garyalies, and the grand Panjandrum himself, with the little round button at top, and they all fell to playing the game of catch-as-catch-can till the gunpowder ran out at the heels of their boots. Perhaps Foote wrote it down. History is mute. Though the speech was composed in the 1750s it wasn't published until 1825 and the authorities seem authoritatively confused as to how the challenge was put. The important thing is that it's a passage that Lewis Carroll would have been proud of. No decent human being could read the words "So he died" without at least smiling. In conclusion, Grand Panjandrums may be recognised by the little round button at the top. The Grand Panjandrum, though, should never be confused with the Great Panjandrum, which was a (slightly insane) explosive device invented during the Second World War and never used. It was called a panjandrum in reference to the gunpowder running out at the heels of the boots. My conversation then turned to She Who Must Be Obeyed, which my interlocutor believed came from Rumpole. She comes from the novel She by H. Rider Haggard. (I always pictured Rider Haggard as a gaunt man on a horse. I was miserably disappointed to find he was a healthy looking fellow with a beard). She is a novel about a couple of jolly brave Victorian fellows who find a secret kingdom in Africa ruled by an immortal and intolerably beautiful lady whom the natives refer to as She Who Must Be Obeyed. She falls in love with one of them and it all ends in tears and wrinkles. She is one of the most extraordinary books ever written. In essence it is the greatest myth composed in modern times: the sort of story that takes a seat in the reader's soul. In execution it is a rather silly ripping yarn: the sort of thing I loved when I was twelve. Imagine the myth of Oedipus with Biggles in the main part. Like the Bellman and bad news, I like to work in groups of three. So I shall leave you with the opening paragraph of another African adventure: Black Mischief by Evelyn Waugh. A marvelous summation of three remarkable pieces of literature. The Grand Panjandrum endures permanently in the subconscious if only for the tremendous phrase, "...and the gunpowder ran out at the heels..." Once heard, never forgotten. 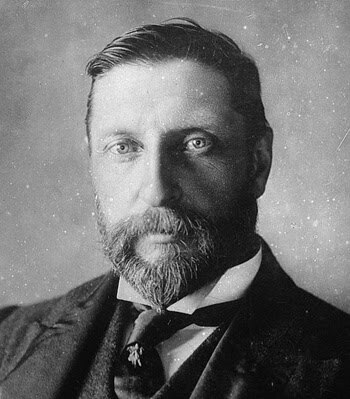 And She by Rider Haggard is an enduring schoolboy classic of yesteryear. Little known is that fact that it was made into an old black and white film that starred Helen Gahagan in the title role. And there can't be too many readers of a certain age, not familar with Evelyn Waugh's satirical tale of Black Mischief. I remain ever grateful to sites like this one for putting the meat on the bare bones of fading memory. And visiting once again and renewing this old acquaintance, I find I still love it.